Actor Mark Wahlberg celebrates his new dealership, Mark Wahlberg Chevrolet in Columbus, Ohio., during a photo session with the store's staff. 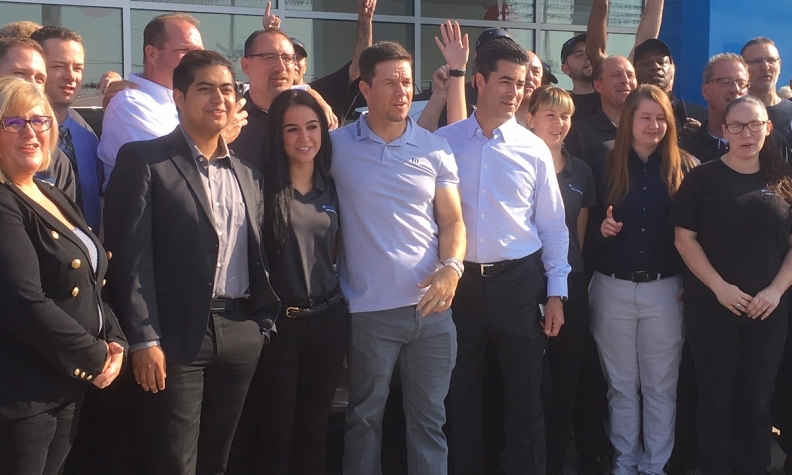 COLUMBUS, Ohio -- Mark Wahlberg made his first pit stop into his namesake Chevrolet dealership here on Monday, going on a test drive with a customer, autographing another customer's vehicle and posing for lots of selfies with staff. The A-list Hollywood actor and entrepreneur, who partnered last month to buy the former Bobby Layman Chevrolet dealership with Michigan dealer Jay Feldman, visited Mark Wahlberg Chevrolet, bringing a buzz of energy into the dealership. During a photo session with store staff, Wahlberg, an executive producer of the HBO series "Ballers," asked whether anyone had watched the show the night before. At the end of the session, he proclaimed: "I'm going to go sell some cars." In addition to greeting customers, Wahlberg held some brief meetings with employees. In tow was his daughter, the media and a crew for the "Wahlburgers" TV show, a reality series showcasing his family's restaurant chain. While it's the first, the Columbus store may not remain Wahlberg's only dealership. "We're looking" for additional locations, said Feldman, CEO of Feldman Automotive Group. He is dealer principal of the Columbus store. Other locations may be in the Midwest, possibly even closer to Feldman's eight other stores in Southeast Michigan. "I want to be as close to and involved in the Midwest as much as I possibly can," Wahlberg said. "So yes, this is hopefully the first -- I don't know of many, but certainly the first one of a few." Wahlberg, who called it a dream to be in the dealership business and pledged to be involved with the operation, has some special things in store for the dealership. For one, he wants to use technology to be able to broadcast messages to employees and customers. "You could be test driving a car and all of a sudden I pop up," he said. And there's some talk of selling Mark Wahlberg-customized Chevrolets, too. Wahlberg has been driving two prototype vehicles -- a customized Chevrolet Suburban and Camaro ZL1 convertible -- in Los Angeles, Feldman said. On Monday, Lori Wycuff, a nurse on the night shift who had come to the dealership early for an oil change, got to ride with Wahlberg. Dealership staff surprised her when she brought her Chevrolet Equinox in, asking whether she wanted to meet Wahlberg. "I'll try to sell you a car today," Wahlberg told Wycuff before he hopped behind the wheel of a bright red Chevrolet Silverado pickup to give her a ride. Wycuff, 41, of Galloway, Ohio, said the two talked about their families and about her job during the brief drive. And there was a business message, too. "He just said if I'm ever in the market for buying a car to come here," she said. And while she's not shopping now for a new vehicle, Wycuff said the down-to-earth Wahlberg won her business. "He's very personable and made me want to come back," she said. Wahlberg and Feldman met in 2013 while Wahlberg was in Detroit filming the fourth installment of the Transformers movie series. The two also are partners in a Wahlburgers restaurant in Cleveland and the Wahlburgers master franchise for Georgia. Wahlberg also said he was in Columbus scouting for potential locations for Wahlburgers in the area. But burger fans won't have to wait until a branch of the restaurant chain opens in Columbus. A Wahlburgers food truck will come to the dealership within a few weeks to help create an exciting experience for customers, Wahlberg said.